With the constant rise in energy costs, building a new home is the perfect time to consider installing a solar water system. The great thing about installing a solar water system is it's powered by the sun, a free and natural resource. You may think you need to live in a warm climate to utilize a solar system, but thanks to new technology you can have these systems installed anywhere. By using the sun's free energy you can cut your hot water energy consumption in half depending on where you live, while helping the environment by cutting back on greenhouse gas emissions. Like all renewable energy products, a solar heating system qualifies for many tax incentives, rebates and discounts. 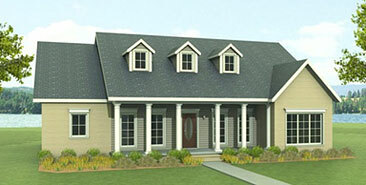 There are plenty of green features packed into this traditional house plan, including 6 inch SIPS, solar photovoltaic panels and solar water panels to generate hot water on sunny days. As a back-up tankless gas water heaters have been installed near high demand points. Once you understand how a solar water heater operates, you will be much more comfortable with considering it for your new home. We won't water you down will all the technicalities, just the important facts. Basically a solar heating system includes well-insulated storage tanks and solar collectors. Active and passive are the two types of solar water heating systems. The biggest difference between the two technologies is that an active system uses electric pumps and valves to transport heat, while a passive system relies on natural convention to move heat. 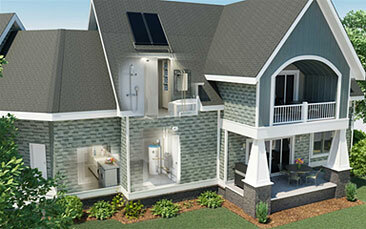 The SolPak® Series by Rheem® is the company's first all-inclusive active solar water heating system. Nicknamed "solar in a box" it comes complete with a heat exchanger tank, collector panels, a controller, multi-speed pump, thermal expansion tank and other essential items. The 80-gallon unit retails for $3250 and is eligible for the 30% tax credit. Active solar water heating systems are available as direct circulation systems where the pump circulates water directly through the collectors and indirect circulation systems which pump a non-freezing heat transfer fluid through the collectors and a heat exchanger. These systems are typically used in areas that experience colder climates. When it comes to passive systems you can choose from an Integral Collector Storage System (ICS) which uses only the sun and works best in warmer climates or a Thermosiphon system which uses gravity to push the heated water through the collector into the tank. With any solar system you want to have an efficient back-up system. The best way to complement a solar water system is to install tankless water heaters since they only heat water when you need it so you aren't paying to keep 40 plus gallons hot and on-call for when you need it. Keep in mind the best time to purchase a solar water heating system is when you are building a new home. For example, over the cost a 30-year mortgage you will be paying an average of $13 to $20 a month for a solar water heater. Think of the long-term benefits of having free hot water and the comfort of knowing that you and your family won't be as effected by fuel shortages and price increases.